Among Medicare recipients, those discharged from the hospital incur about a 20 percent risk of an unplanned readmission within 30 days. The number is higher for some conditions such as heart failure. This is the result of a terribly dysfunctional health care delivery system. Of course some patients will need readmission; the number can never be pushed down to zero, but 20 percent is appalling. Why does this happen? Many factors are involved. One is simply not evaluating the patient carefully before discharge. Unacceptable, but it happens. My neighbor, in generally good health and playing tennis most every day developed chest pain, had an angiogram and was sent for coronary artery bypass. He was sent home after three days and was back at the ER that night with severe difficulty breathing. It was a large pulmonary effusion; he was readmitted; no doubt it was there when he left that morning. A second is inadequate discussion of post-discharge instructions including medications. Another neighbor had a lengthy hospitalization overseen by the hospitalist. He was sent home on 17 (!) medications. One was the wrong dose — much too high and hence toxic. But he did not know that and took his meds as prescribed. He was back in the hospital in a few days. It was more than the drugs, however. He was not really ready for home. Which is the third point. The patient may be technically OK to leave the hospital but really not ready for home. He needs an intermediate stop –– which is either hard to find or else just not paid for. This is an all too common problem, especially among older individuals with multiple chronic illnesses and on multiple medications. (85 percent of Medicare recipients have 2 or more chronic illness and are on 5 to 7 prescription medications. One-half have three of more chronic illnesses, one of which may be confusion if not outright dementia of some degree.) There was a time when the doctor would just keep the patient in the hospital for a few more days, but this cannot be done anymore given the economic pressures. And payment issues make other options difficult to arrange. Discharge education is weak at best in most hospitals. Yes, there is a sheet signed by patient and nurse that the discharge instructions were reviewed. But the patient is often confused by the instructions, is embarrassed to ask questions and family members, if present, may not fully understand either. They don’t know, nor are they often told, that these instructions can be critical. A fifth reason, and I think it is the most important reason, is lack of good communication between the patient’s primary care physician and the hospitalist. PCPs rarely visit their patients in the hospital anymore, so they do not know what has transpired and often don’t even know that their patient is in the hospital. Verbal communication between PCP and hospitalist often does not occur. The discharge note may be days (if not longer) in reaching the PCP. Add to this that most discharged patients should be but most are not seen by the PCP within 48 hours of discharge. This is crucial to review drugs, check on the patient’s general status and inquire about any lingering issues, repeat the needed education in a manner the patient (and family) can understand, and emphasize what is important to do over the next days and weeks after discharge. That time of patient education is critical but rarely occurs. Hospitals are being aggressively incentivized by Medicare to reduce these unplanned readmissions. That is good on the surface, but all too often the fix is a sort of cover-up. The patient comes to the ER and is put into “observation” rather than actually admitted. That doesn’t incur the wrath of Medicare, but it still means that the system was not working well in the first place. It is not a real improvement for anyone. In an earlier post, I reviewed what a continuing care retirement community does to reduce readmissions. The in-house PCPs have a limited number of patients (about 400) and hence have adequate time per individual. Most hospital admissions are known to the PCP, at least by the next morning. There is perhaps not perfect but pretty good PCP to hospitalist communication, both at admission and discharge. An EMR record is sent to the hospitalist when the patient is admitted. Every discharged patient is seen by their PCP within 48 hours. Ideally, the PCP would visit the patient regularly in the hospital. This was found valuable in maintaining the care of the patient’s other medical problems so that the hospitalist could focus on the acute issue that led to admission. The combination of these activities has brought the readmission rate down to about 10% on a continuing basis. Reducing hospital readmission is not all that complex. It is about returning to the basics — especially good communication. 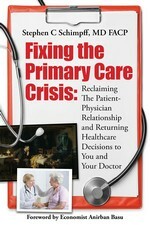 Of course, that takes time and time is what both PCPs and hospitalists have all too little of. If Medicare wants to have a real impact, start with ways to give the doctors time to be effective. < Previous post Is the sports physical hazardous to your child’s health?